Sure, Key West is famous for Spring Break and outstanding vacations, but until you book a Key West Snorkeling Tour, you won't know what you've been missing. Key West is home to the third largest living thing on the planet. The coral reef at Key West stretches for over 130 miles with some of the most beautiful coral, tropical fish, and underwater views imaginable. Easy to get to and with no language barriers to deal with, Key West is a great place to go on vacation. You can reserve your spot on a Key West Snorkeling Tour from the convenience of your computer and, before you know it, you will be aboard a luxury custom charter, heading for secluded, pristine waters populated with some of nature's most stunning residents. Everything you need for your Key West Snorkeling experience is already onboard, including fresh water showers, restrooms, and gear storage and photo tables to keep your video equipment safe and dry. Even if you have never gone snorkeling before, we will give you great tips and all your gear so you can be on your way to creating memories and photographs that will last a lifetime. You are bound to be amazed at the sea life in Key West. You will see sailfish that grow to 7-feet in length, 40-pound blackfin tuna, 30-pound wahoo and mahi mahi, also known as dorado, and the ultimate blue marlin. The largest blue marlin found in Key West weighed in at over 600 pounds! You will also see tarpon, hogfish, shark, dolphin, sea turtles, lobster, and a myriad of smaller, colorful tropical fish as they dart for cover in the brilliantly colored coral. You will also see colorful parrotfish, grouper, spiny lobster, queen angelfish, and sea turtles. You may be approached by playful dolphins, curious sharks, and many varieties of tropical fish. Clearly, you will be very busy photographing these magnificent creatures on your Key West Snorkeling Trip! All you need to bring is a towel and your swimsuit. The boat and gear are all provided for you, including complimentary snacks, sodas, beer, and wine. 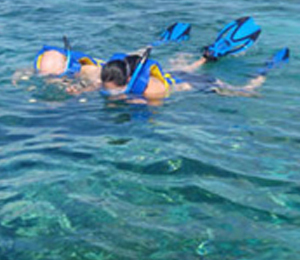 Your snorkeling adventure is a great way to explore the stunning coral and sea life of Key West. The coral is only 3 feet below the surface and reaches down to the sandy bottom, only 35 feet down. Even from the surface, you will be able to see a variety of snapper, including mutton snapper, mangrove or gray snapper, and yellowtail. You will also see red, black, gag, goliath and snowy grouper, African pompano, barracuda, cobia, amberjack, king and cero mackerel, and countless smaller tropical fish on your Key West scuba diving holiday. If you prefer, a Key West scuba diving adventure takes you to some amazing shipwrecks. You may visit Joes Tug, a 75-foot tugboat, or the Cayman Salvager, a monstrous 180-foot steel-bodied wreck called home by countless anemone, starfish, coral, and tens of thousands of tiny, brilliantly colored tropical fish. The 55-foot wooden tugboat known as The Aquanaut provides amazing photo opportunities. Be sure to charge those underwater camera batteries because you won't want to stop once you get going as you snap shots of shrimp, lobster, crab, and yellowtail! The reefs of Key West are stunning. You simply won't believe the colors and the variety as it changes constantly from location to location. Smaller charters can sneak you into secluded spots, unmolested and cluttered only with the plants and creatures made for Paradise. Friends and family will never tire of the stories you bring home from your Key West scuba diving holiday.